If you’ve ever wondered what “air-cooling” for comfort means, it’s the use of a chiller to cool the skin and diminish the pain associated with PicoSure laser tattoo removal. Normally, the laser energy passes painlessly through most skin types and concentrates its energy on the pigment. However, the reaction with the pigment can be strong and occasionally produce minor pinpoint bleeding, frosting and bruising of the treatment area. When this occurs, the nerve endings send a signal to the brain that something is happening. The pain has been likened to a rubber band snapping against the skin. This is an accurate statement due to the fact that the patented PicoSure picosecond PressureWave does cause a strong photomechanical impact. The tattoo pigments are shattered in to fine particles as a result of the impact stress which allows them to be removed by the body. All in all, the PicoSure laser tattoo removal treatments are much faster than the tattooing process itself and are rarely excruciatingly uncomfortable. 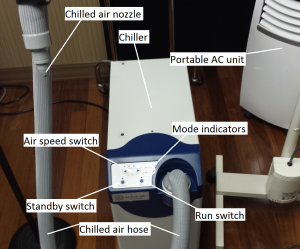 In addition to the air chiller (shown below) I also may use topical numbing cream or Lidocaine injections, when necessary, and take appropriate breaks to allow the patients to relax. Some folks like to wear their headphones to block the sound of the laser while listening to their favorite tunes. Whatever it takes, we’ll do it. Before you know it the treatment is over and you’re one step closer to having that tattoo gone forever. If you would like to discuss your tattoo removal options I can be reached by phone @ 512-479-9997 or just stop by my NEW location in Austin, TX: Austin Medspa on W. 6th St.